I did this walk on Saturday 1st December 2007. 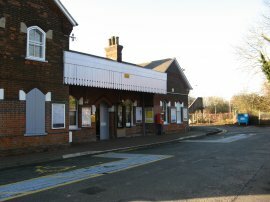 I drove down and parked at Lenham station which is at the start of the Stour Valley Walk. 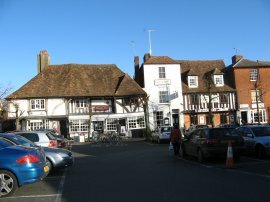 I had been going to drive to Ashford and take the train to Lenham to start the walk however I was running a bit later than planned and the train I had been intending to take from Ashford was actually at Lenham station when I arrived there. With only one train an hour I would have had a long wait at Ashford until the next train if I had continued there in the car although of course I now might have a similarly long wait when I get to Ashford. The advantage is though that I will be making the best use of the brighter part of the day for walking. From the station, photo 1, I headed up the long station driveway and then turned left along the road and made my way to the very picturesque centre of the village. The village contained a number of very attractive buildings, photo 2, however as I have often found in such places, it is often hard to get any decent photo's due to the masses of cars that were also crowded around in front of the buildings, photo 3. Turning right at the village square the route passes through the churchyard of St Mary's Church, photo 4, and takes a footpath that runs out over fields to cross some railway lines. 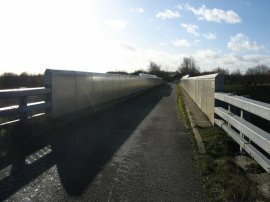 Once over the railway lines the route turns left, running parallel with the tracks until level with a bridge under the railway where the route bears to the right and takes a footpath that heads across a field, photo 5. 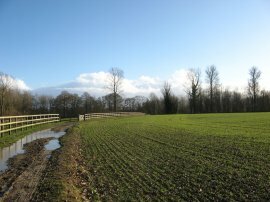 The day had dawned bright and sunny although the previous evenings torrential rain had left the paths across the fields very wet and muddy with a number of patches of standing water on the surface in certain places. The route heads diagonally across another field and then turns right past a small, but rather smelly, sewage treatment works. Running besides the sewage works I encountered the Great Stour River for the first time on the walk, although at this point it was nothing more than a fairly small stream. 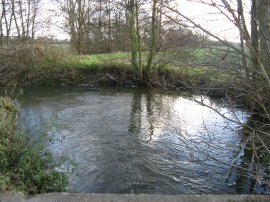 The route crosses over the stream to join a concrete track that leads to the sewage works which is followed up past the buildings of Chapel Farm to join Lenham Heath Road where the route of the Stour Valley Walk turns left. 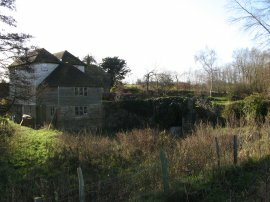 This part of the walk was accompanied by considerable traffic noise, coming from the nearby M20 motorway. After half a mile the route turns right to take a bridge, photo 6, that runs over the lines of the channel tunnel rail link and then immediately crosses over a second bridge which takes the route across the motorway. 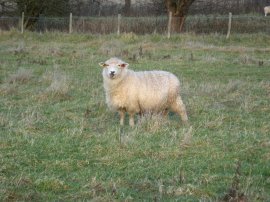 Once over the motorway the route bears to the left for a short distance before turning right past the barns of Hubbards Farm to head out once again into an open field which, when I passed through, had quite a large flock of sheep in it. 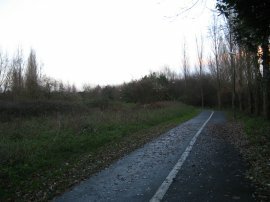 The route then turns to the right by a fence and continues ahead over a number of fields, running parallel with the M20 motorway. 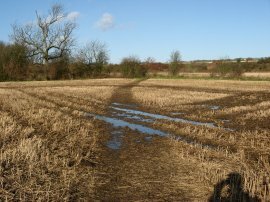 The fields were generally quite small and there were a succession of stiles, in various states of repair, to cross. On the way the route passes close to the buildings of Burnt Mill, the river still running through the old mill channel, photo 7. 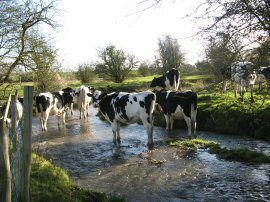 A little further downstream I came across a group of cows standing in the stream, photo 8, and amongst them I spotted a Little Egret, although true to form it soon flew away as I approached. 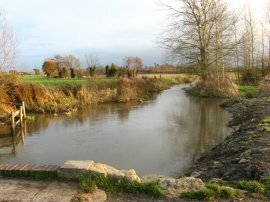 The route crosses a wooden bridge over the river and heads up to the right over a field to join a lane where the route of the Stour Valley Walk turns to the left along coach Road. Reaching a road junction the route then turns to the right and heads along Field Mill Road. 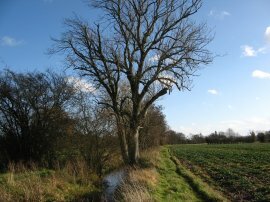 This is followed down to the Field Mill where once again the route turns to the left heading out over fields, photo 9. Unfortunately it wasn't possible to see the millpond marked on the map which was hidden behind a fence by Field Mill house. Approaching a house the path bears to the right and heads along the right hand side of a pond before turning sharp right to head uphill beside a field. At the top of the field the Stour Valley Walk turns left along a rather stony and muddy track. Looking back the way I had come, photo 10, there were good views across the valley of the Great Stour over to the North Downs, which the Stour Valley Walk runs parallel with for most of its route to Ashford. Reaching a road the route heads right, and then immediately left, to join a rather muddy and rutted byway, Nettlepole Lane. After about half a mile, photo 11, the path bears left through a small patch of woodland at Little Pipers Wood, before crossing diagonally across a small field, photo 12, and then following the left hand edge of another field to reach a road. 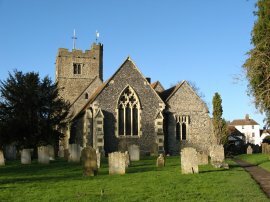 At the road, which was rather busy, the Stour Valley Walk heads downhill to the left for a short distance before turning right into the churchyard that surrounds the ruins of St Mary's Church at Little Chart, photo 13. 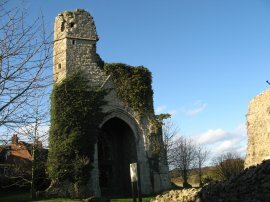 Sadly the church was almost completely destroyed in 1944 when it was hit by a stray flying bomb. Passing through the churchyard the route passes by the building of a farm and continues ahead on a rather muddy farm track, photo 14. The route then follows this track to reach a road by the Swan Inn Pub in Little Chart, photo 15. Here the route of the Stour Valley Walk links up with the route of the Greensand Way which I had walked some 12 or so years ago. The route then passes a particularly ugly brick built church which was built as the replacement to the bomb damaged church past earlier. The contrast between the ragstone built old church and modern brick one could hardly have been greater. 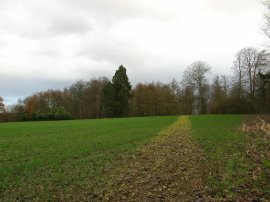 After heading a short distance along a road the route bears left to take a footpath that runs gently uphill over a large ploughed field, photo 16. At the end of the field the route turns right and goes on to reach the edge of a garden where there were three rather noisy poodles barking and running along the fence. This path is followed round to the right to reach a driveway which leads down to Ram Lane in Little Chart Forstal. 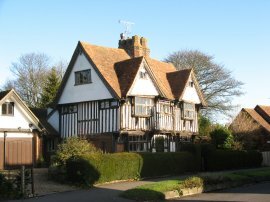 Here the route turns left along the road, past a village cricket pitch, photo 17, which is surrounded by a number of extremely attractive, and probably very expensive, houses. 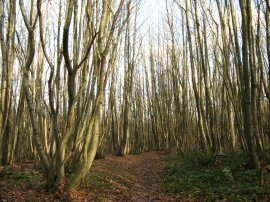 It was odd walking along this section of path shared with the Greensand Way, photo 18, as although I had walked it some years before I could not remember any of the sites I was going past and it was strange to think that I had actually walked here once before. One of the advantages of writing up these pages is that, as well as being able to share the walks with family and friends, it also seems to fix the details in my memory much more clearly. 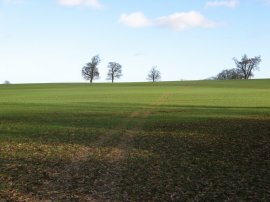 I only took a very few photos when I walked the Greensand Way and it was long before the advent of affordable digital camera's, or probably any digital cameras for that matter. A little further down the Ram Lane, past the last house on the left, the route bears to the left heading very gently downhill over a field towards some trees. 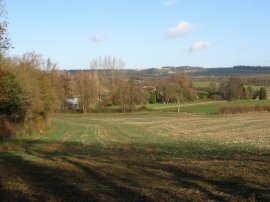 To my left there were attractive views across the Stour Valley towards the North Downs. The route then crosses back over the Ram Lane again and heads through a patch of woodland, photo 19, before taking a wooden bridge back over the River Stour. Once over the bridge the route continues ahead over some rather damp muddy fields although I am sure at other times of year with less rain the grassy paths would be very pleasant to walk along, however today I was slipping all over the place. Leaving these fields the route heads into Hothfield Common, photo 20, where the path turns right. 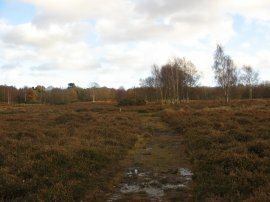 The small area of heath land, with its heather, almost peaty soil and bogs was completely different from any other areas the route had past through so far and was definitely the highlight of this stage of the walk and an area I would like to come back and explore further. Leaving Hothfield Common the route turns left then soon turns to the right through a gated stile, heading across a paddock and over another stile into a field. 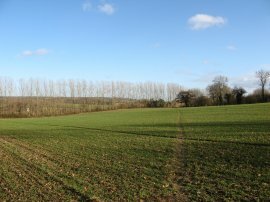 Here the Greensand Way heads off to the left while the Stour Valley Walk continues ahead over the middle of a very large field. It was a very windy day, although much of the route had been relatively sheltered from the wind, however in this open field the wind was blowing directly into my face with nothing to impede its strength which soon had me feeling quite chilly. Leaving the field the route heads over a road and onto a byway, photo 21, which fortunately was not as muddy and as rutted as the previous one the route had passed along. 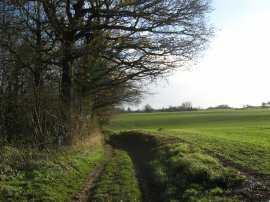 The route continues ahead past Hall Farm Cottages as it follows the byway for just over a mile. The byway seemed little used by motorised traffic although two motorcyclists did pass me as I was walking along it. It crosses back over the River Stour, photo 22, and then starts to head gently uphill to eventually join a road where the route of the Stour Valley Walk turns left along Pluckley Road. 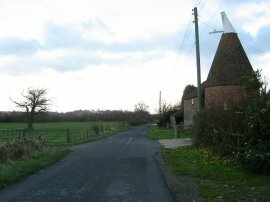 The route heads along the road past Hurst Hill Farm with its small oast house, photo 23. 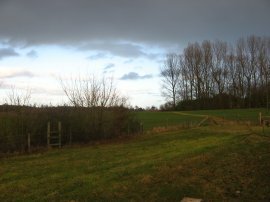 As I was walking along this stretch of path the sky was steadily getting more and more overcast and there was a particularly large dark bank of cloud behind me which was in marked contrast to the bright cloudless start of the day. Reaching Bear's Lane the route turns right before soon leaving the road along a foot path that turns left into a field before turning to the right to run round the field edge, photo 24. As I was walking along this stretch of path the heavy clouds caught up with me and it started raining and I stopped to shelter behind some bushes while the rain blew over. Fortunately in the strong wind this did not take too long and I managed to avoid having to put my waterproofs on. 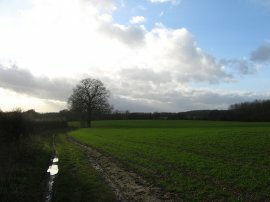 As the rain started to ease off I headed over a short but very muddy stretch of field into Worten Wood, photo 25. Leaving the woods I continued over a couple of small fields before turning right on to the driveway of Worten Mill which leads down to a road where the route turns to the left before once again crossing over the Great Stour River. After about 1/4 mile the route leaves the road taking a path to the right that runs past the playing fields of Swinford Manor School. Having passed besides the school buildings the route heads out over some grassy fields to once again cross over the river, I wish I had kept a count of how many times the Great Stour is actually crossed on this stage of the walk. Once over the river the route continued ahead over more grassy fields that were being grazed by flocks of sheep, photo 26. Reaching another bridge over the Great Stour, photo 27, the route turns to the right along a track, Chart Avenue, once again linking up with the route of the Greensand Way. This time I could actually remember walking along this part of the path and recalled having stopped for a rest by the bridge before the final couple of miles into Ashford. As I was walking along the track this time around I saw a number of Lapwings flying along besides the path, the first I had noticed for some time. 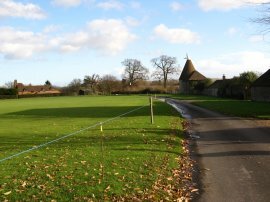 The path heads along Chart Avenue, over some railway lines and past the clubhouse of Great Chart cricket club to reach a road where the route turns to the left for a short distance before heading right to head across a playing field. Leaving the playing field the route crosses a footbridge and then passes under the A28 road before heading through a small patch of woodland on a very muddy and dingy path which for a while had me doubting I was actually on the right route. Leaving the woodland the route turns right to run alongside the Great Stour river over a patch of open ground, heading towards some houses, which leads to a road and the Singleton Lake, photo 28. 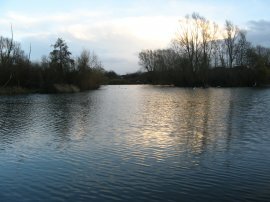 The route then follows the left hand edge of the lake. 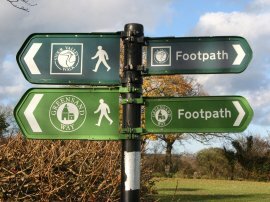 Leaving the edge of the lake the route then follows a broad tarmac footpath and cycle path that runs right into the centre of Ashford through a narrow strip of parkland running along the Great Stour River known as the Green Corridor. 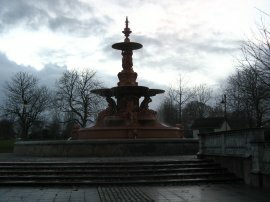 This is made up of parks, recreation grounds and other green spaces alongside the rivers that flow through Ashford. From the Green Corridor it was just a short diversion up the road to reach the Ashford International Station. At the start of the day I was worried about having a long wait for the train but as I neared the station I realised that one was due imminently and I picked up my pace or the last mile or so which meant I got to the station with just three minutes to spare before the train left. It also meant I just missed another large downpour which started just after I had boarded the train for the journey back to Lenham and the car. Reaching Ashford station I had walked 15.0 miles, all along the Stour Valley Walk. 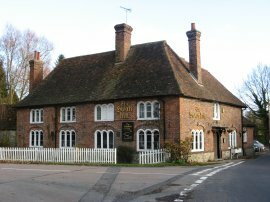 This has been a very pleasant scenic walk, largely avoiding any roads and visiting hardly any villages, through a very attractive part of the country and I am looking forward to doing the next stage towards Chilham or Chartham.